The Ford Fiesta was facelifted in 2013 and now sports a trapezoidal grille that makes it look like a baby Aston Martin. That’s a serious statement for a car that could be yours for just under €16,000. Ford says that the latest version of their long-serving supermini is like a new smartphone, combining contemporary style with state-of-the-art technology. Let’s find out. The big, wide gaping hole of a grille is a brave move by Ford but it’s worked and the Fiesta could no longer be accused of just blending in. There’s no fussiness, just clean lines and a smart-looking, compact shape (see it here). It’s finally got the body it deserves and can really pull off a sporty look. The Fiesta looks particularly good in 3-door guise in Titanium trim with nice alloys and chrome trim below the window line. Inside, it’s standard supermini fare, with an attractive steering wheel set up and blue and white illuminated instrument dials and driver information screens. The two cupholders did not go unnoticed either and the classy chrome strip around the gear stick gaiter. These are nice touches but it’s not the best cabin in the class and the centre console suffers a bit from too-many –buttons syndrome. There is loads of room up front for driver and passenger, and two adults can sit comfortably in the rear – but the sloping ceiling to the rear of the car might restrict taller passengers. The boot is up to class standards – 276 litres with a full size spare wheel included. The rear seats can be folded down for larger items but they don’t fold down flat and the boot loading lip is quite high. 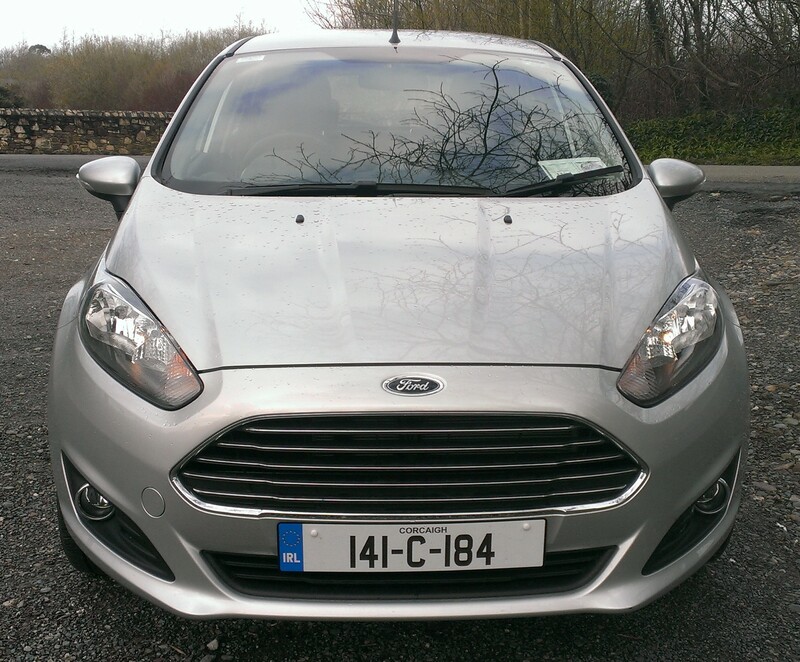 The Fiesta has now got an absolute gem of an engine in the line-up – it’s the 1.0 65bhp EcoBoost petrol engine. It’s not turbocharged and on paper it looks really slow with a 0-100kmh sprint of 16.8 seconds. It feels far perkier than that on the road. It’s matched to the Fiesta’s excellent driving dynamics and the two are in perfect harmony with one another. The engine has a rather sporting tone to it too and if you close your eyes (not advisable while driving!) 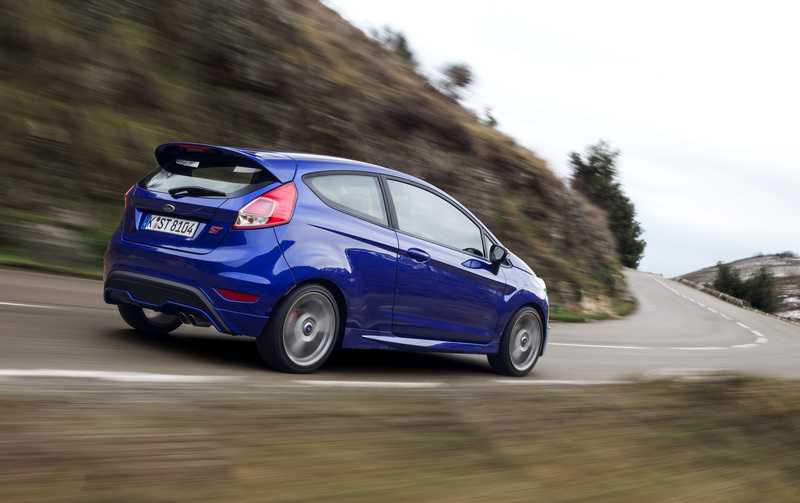 you could just imagine that it might be the 182bhp ST! It feels alive and has a pep in its step like no other small car I’ve driven. Matched with great ride and handling, road holding abilities and sharp steering, it’s a potent mix in a supermini and the Fiesta feels like a much bigger car. Around town the Fiesta is compact, nimble and the light steering makes easy work of parking and maneuvering. On longer motorway journeys it is comfortable and feels well-planted on the road, but the revs do run high at motorway speeds. For a petrol engine it’s relatively economical and the official figure is just over 65mpg. But if you rev it too enthusiastically that economy will diminish, as it will out on the motorway where the revs run near the 4000rpm mark at 120kmh. The EcoBoost engine has emissions of just 99g CO2/km and that places it in tax band A2 so your motor tax bill will be just €180 per year. The engine is also fitted with fuel saving start stop technology. Entry level models come with daytime running lights, rear spoiler, electric front windows, electric heated mirrors, USB and Aux connectivity, ABS, ESP and hill start assist, 7 airbags (front, side, curtain and knee), and central locking. 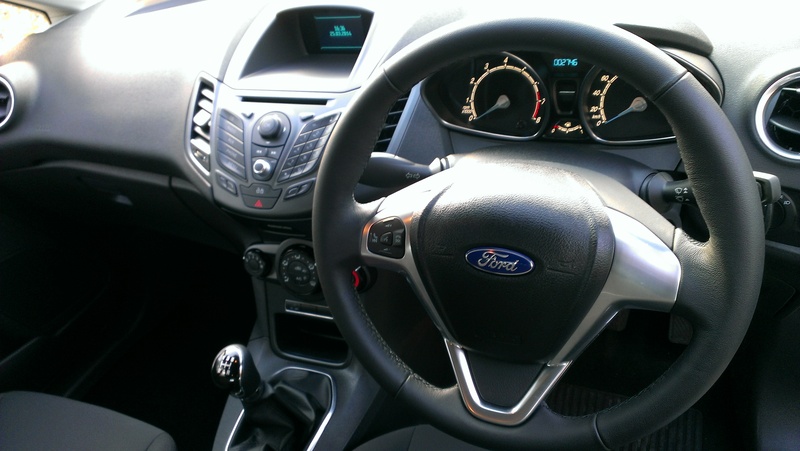 For things like smarter wheels, front fog lights, trip computer and steering wheel mounted audio controls, air con, Ford SYNC and MyKey (allows owners to program key and control things like maximum speed) consider the Zetec or Titanium trim. Ford SYNC allows you to use the stereo or make phone calls by voice command and via steering wheel mounted audio controls. It’s a good system but a little bit of time is needed to learn how to use it safely on the move. Cruise control is an option on all but entry level models. Only a lucky few will ever own an Aston Martin – but for the rest of us there is always the Ford Fiesta. The Fiesta sparkles with great driving dynamics, good looks and peppy petrol power in the shape of the 1.0 litre EcoBoost engine.